Syntholine offers rubber cords in various sizes and materials like NBR, EPDM, Viton®, Silicone, Sponge Neoprene. Rubber cord is commonly used in sealing applications where the exact size moulded o-ring is not available. Very good ozone and weathering resistance, as well as the resistance to acids and hydroxides with low concentration. Temperature Resistance: -30 to 150 Deg C.
We offers O-rings for all applications and industries. We make hundreds of standard and custom moulded O-rings. 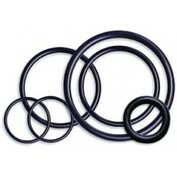 If we do not have a particular size, we offer custom molded O-rings. Tell us the sizes you need for your custom fit O-ring seals or let us design the O-ring gasket you need. We can even mould custom square section O-rings to be fitted to the exact size and specification for your application.